The design of the trusses means a wide, stable surface that is easy to work on and around. Spacing at either 19.2″ or 24″ means both the floor and building will have additional structural integrity. Additional details can be easily built in, such as special bearings, cantilevers, and balcony details. Our quality wood used reduces warping and twisting, reducing risk for callbacks to fix. 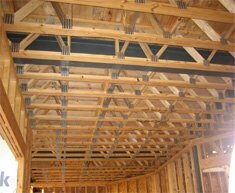 Long spans and girder trusses are available, which reduces or eliminates need for beams, columns, or footings. There is plenty of room for pluming electrical and mechanical runs thanks to the open web configuration of the trusses. Want to make an inqury about our product, please click here to fill out the contact form to start the process! Designed and Hosted by IX Publishing.